Dr. Miinala Marketing has announced that they are now offering free snapshot reports for Estheticians. 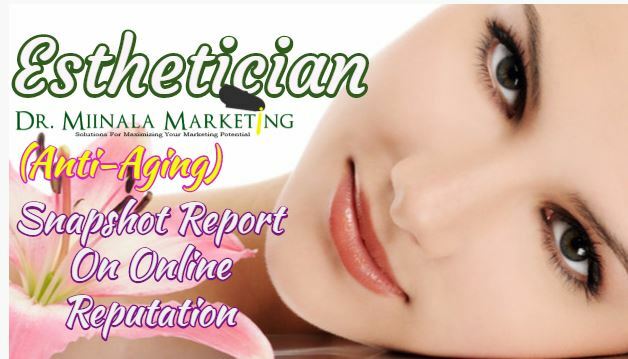 In these reports the online marketing company provides information related to the reputation of the esthetician specialist. A spokesperson for the company says, "Our goal is to give you a peek into what your business looks like online and how customers may be seeing you." The company states that they can help esthetician to determine whether or not their business listing is accurate, what specific sites their clinic should be listed on, and how their clinic businesses compares with industry standards. They say that their report will also help businesses to determine whether or not their social media accounts are effective and if not, the company can help the firm effectively reach people through Facebook, Twitter, and other social media accounts. "You just have to input your business data and you will get the information you need to step up your marketing strategies," the company spokesperson says. The report can be accessed at http://drmiinalamarketing.com/free-reports/, and the company says that those interested will receive the information that they need to reach more local clients. Dr. Miinala Marketing includes a staff of marketing experts, SEO specialists, graphic designers, and developers that work one on one with businesses to help them increase their marketing effectiveness. The company states that every system they use goes through rigorous testing to ensure that it will ultimately help their customers to grow their businesses. More about the company can be seen on their Facebook page at https://www.facebook.com/Dr-Miinala-Marketing-1501924106775770/?fref=ts. The company spokesperson states that the free report is now available to esthetician owners, no matter where they may be located, and that it can help estheticians to determine if their chosen local advertising is working and how to improve and increase their overall reputation, which could ultimately lead to a higher number of clients. Those interested in learning more about Dr. Miinala Marketing can see more on their LinkedIn profile at https://www.linkedin.com/company/dr--miinala-marketing. Esthetician owners interested in taking advantage of the free report can do so on the company's official website.